Saturday morning, September 16, was dark and murky in the sky but on Windham High’s field, the Varsity Girls’ soccer team was shining bright. Windham came out strong against the Maine Girl’s Academy (MGA) and continued to shine throughout the game. The girls banded together to play exceptional offense and defense, not only scoring multiple times in two halves, but keeping the ball out of their end zone for large portions of the game. Windham’s great communication and effective ball passing gave them multiple players who scored in the first half. Maggie Llyod (#10) scored the first goal, Hannah Kaplan (#15) scored the second, Julia McKenna (#13) scored the third and Sara Barrett (#16) scored the fourth goal. The fifth goal was scored by Emma Yale (#40) with an assist by Rylee Pepin (#4). All in all, the first half was fast paced and exciting, with the girls bearing down hard on MGA. The Varsity Girls continued to show they had what it took against MGA at the start of the second half; Windham came out with just as much power as in the first half. They continued their steady offense and defense. Their communication remained strong, resulting in another four goals scored. McKenna assisted Llyod for the first goal of the second half. 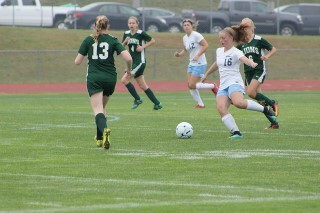 Meghan Hoffses (#6) scored the second goal and Llyod scored the final Windham goal. MGA had an owned goal, scoring on themselves, to make the final score: Varsity Girls 9, MGA 0. Head coach, Deb Lebel and assistant coach James “Jimmy” Stewart, were pleased with the outcome of Saturday’s game and how their players played to achieve that outcome. “We had eight different scorers, so it wasn’t just one player; we had eight different people be able to put the ball in the net. I think they did a great job of really trying to focus on that,” said Coach Stewart. Their next home game is Wednesday, September 27, when they take on Thornton Academy at 6:30 p.m.